Busua is 30 km (19 mi) west of Takoradi and 12 km (8 mi.) from Agona. The easiest way to get to Busua is by grabbing a taxi from Takoradi. A cheaper option is to take a tro-tro from Takoradi to Agona. At Agona Junction you can take a shared taxi to Busua. Always wanted to try surfing? Busua is the ideal place to go! 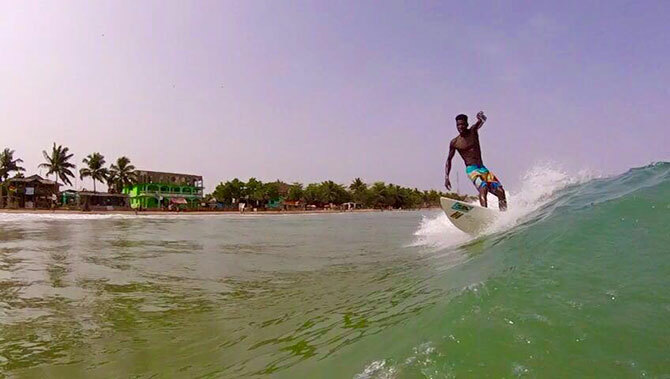 There are two surf schools side by side, Ahanta Waves Surf School & Camp and Black Star Surf Shop, both offering exceptional value surf lessons with good local instructors. 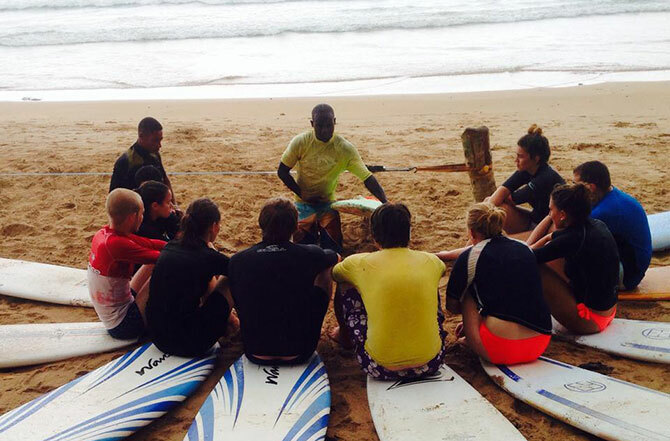 You can get private surfing lessons tailored to your level or you can learn as part of a group. If you already know a bit of surfing, you can just rent a board and head out. There are almost surfable waves every day in Busua. Most days, the beach break is suitable for beginners and intermediate surfers, while more advanced surfers can paddle out to the Black Mamba point break, one of Ghana’s best waves. The surf schools offer “surfaris”, where you can search for great waves at awesome locations with your instructor. Lastly, Busua is home to some of Ghana’s best surfers doing all kinds of acrobatics on their surfboards. So while you are resting your arms enjoying a coconut shake from one of the many beachfront restaurants, you get a free show. Check out some local footage from Busua Beach. Busua is still not as popular a surf destination as other more famous surf destinations, so you will get an almost empty line-up on most days. Where to Stay in Busua? Busua has several options in the low and mid budget range. Bear in mind that in Ghana service level and maintenance of facilities are generally lower than international standards. If this is not to your liking, Ghana is probably not the holiday destination for you. There is one 3+ star hotel, Busua Beach Resort, with a fitness room and swimming pool, your best option if you want something resembling luxury. However, the hotel sector in Ghana has been rough the last few years, so on most days, the hotel is rather empty. Here, we will focus on two popular beachfront hotels in Busua, Busua Inn and Scorpion Lodge. 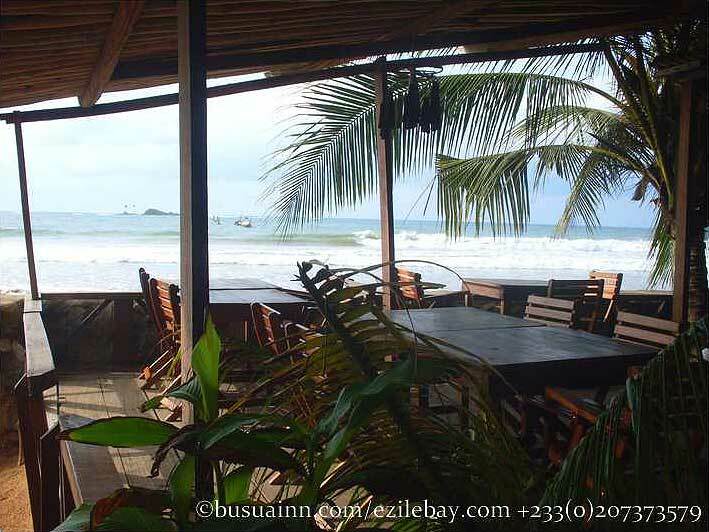 Centrally located in the town, Busua Inn is a good bet for those who seek comfort, good food, and an inviting beach front view from the cafe and restaurant. The cuisine is a fusion between French and Ghanaian food with many freshly caught seafood items on the menu. The inn has only four rooms. Busua Inn has a resident monkey. It’s semi-wild, so treat it with caution. Busua Inn is not the among the cheapest options in Busua, so if you are turning coins, you should look elsewhere. It is suitable for families and couples. 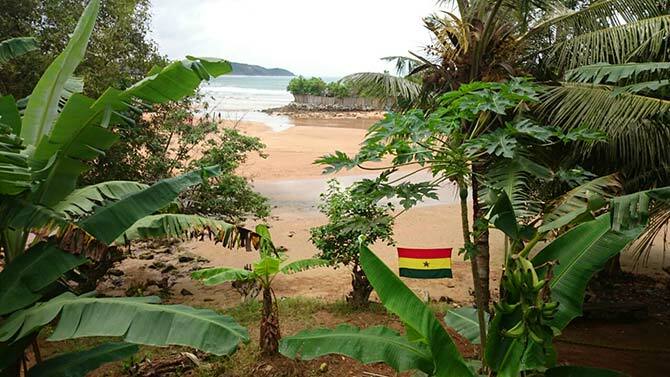 The lodge is located at the western corner of Busua Beach, five minutes walk from the town centre. It has a nice beach facing dining and cafe area with chill-out hammocks. Scorpion Lodge is a popular choice among backpackers and volunteers. It has dorm beds and simple private rooms. Scorpion Lodge is very affordable and a good choice for those who want to save their money for meals and drinks, and perhaps some surfing courses instead. If you are not ready for simple acommodation, take a walk along the beach and review your options. The team behind Ahanta Waves Surf School & Camp are currently building their own eco surf lodge. It’s located near Scorpion Lodge, and will undoubtedly be the place to stay in Busua for all wave explorers. The lodge will provide surfing packages inclusive of surfing lessons, board rentals, and accommodation. Stay tuned.